One year ago, entire towns across North Carolina sat underwater. Hurricane Matthew swept across the state in October 2016, drowning homes and businesses with record level floodwaters. Over the course of the storm and the following days, over 50 counties across the state received damage costing over $2.8 billion, combined with a $2 billion economic loss. 4,300 people were displaced among 52 shelters, and more than 2,000 people were rescued from high water across the state. North Carolina’s vast transportation network was sent spiraling into chaos, with nearly 600 roads across the eastern portion of the state closed, including 43 miles of Interstate 95 as well as Interstate 40, according to the NCDOT. It’s estimated that the hurricane dumped 13.6 trillion gallons of water on the United States, equal to roughly 75 percent of the Chesapeake Bay, or enough to fill the Rose Bowl 163,000 times. Matthew changed lives and plunged communities into disarray for months. Some are still struggling to recover. Others sit as empty shells off of major highways, grappling to return to their former identities. Two of the hardest hit towns in North Carolina, Princeville and Fair Bluff, both have two different stories of recovery. Both suffered massive damage in the flooding caused by Matthew, but have taken different approaches in the aftermath, recovering in separate ways. The price of Matthew in Princeville, N.C.
Princeville, a town of nearly 2,000 on the Tar River in central Edgecombe County, lies just off of U.S. Highway 64, the major east-west route between Raleigh and the Outer Banks. 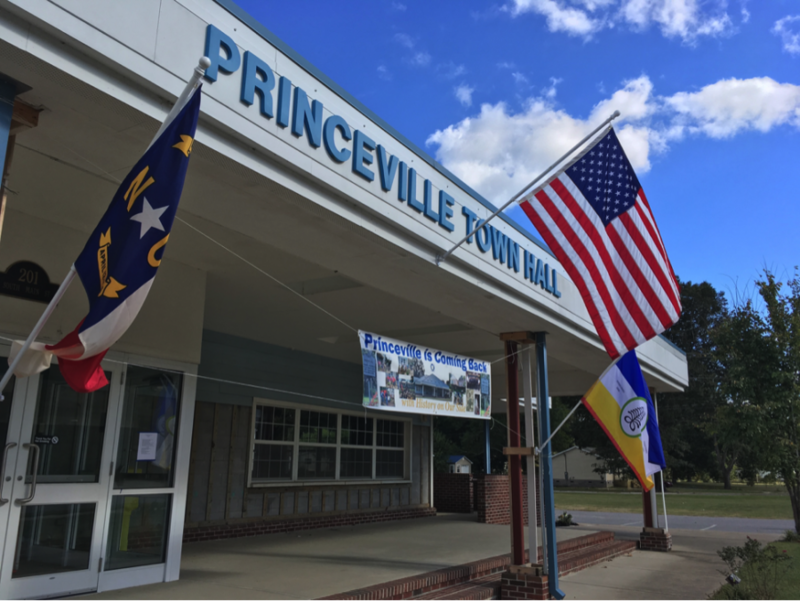 Just across the river from the much larger town of Tarboro, Princeville was inundated by Matthew’s floodwaters in an almost catastrophic repeat of Hurricane Floyd in 1999, which left many residents in FEMA trailers for over a year. Princeville is notable for being the first community founded by freed black slaves in America, settled in 1865 at the end of the Civil War, and incorporated in 1885. The town suffered from population decline after numerous flooding events, but always rebounded. In 1967, the Army Corps of Engineers completed a three-mile long, four-million-dollar earthen levee that protected Princeville from up to 37 feet of water. Unfortunately, during Hurricane Matthew, the Tar River crested at 36.2 feet, causing the levee to fail, as it did once before during Hurricane Floyd. The water poured over the levee and surged into the historic town, leaving homes completely water-logged and soaked in debris. 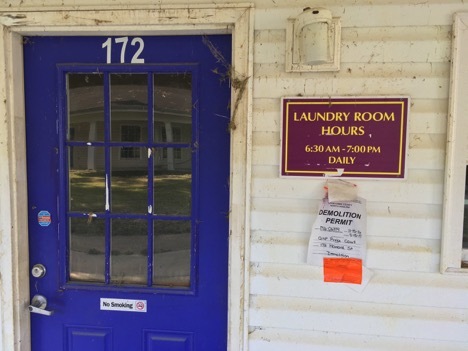 A demolition permit dating back to November 2016 is still taped to the side of Prince Court Apartments’ laundry room in Princeville, N.C. The permit expired in May of 2017. Many of Princeville’s residents lack flood insurance, which only made things worse when nearly one-third of the town’s homes were heavily damaged. Today, if one takes a ride down South Main Street through Princeville, red stickers and demolition permits can be seen plastered on many front doors, especially ones with immediate proximity to the river. Caution tape still guards the entrances to Prince Court Apartments, behind Princeville’s town hall. The apartments were designated as Section 8 housing before Matthew. Closer to the bridge to Tarboro, the town hall remains under renovation. Some homes have been raised up on cinderblocks while others lay vacant. 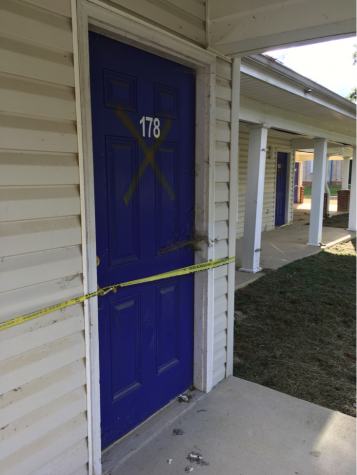 Caution tape still snakes it away across multiple doorways, guarding the rotting interiors of housing complexes. Princeville Elementary School stands empty in the center of town. Princeville’s fire station one year later, now a derelict memory of Matthew’s flooding. 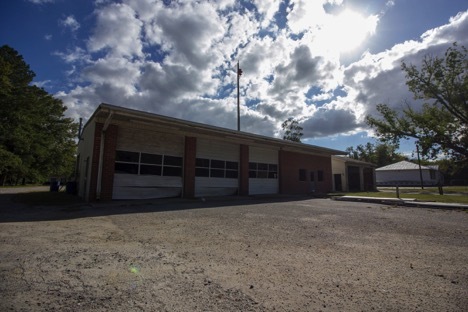 The fire station on Mutual Boulevard sits in disrepair, its ghostly remains a reminder of the storm that blew through only twelve months ago. 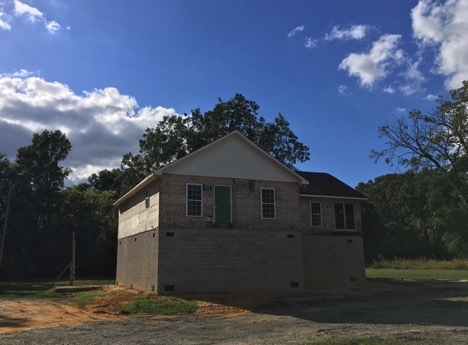 After it was flooded, this home in Princeville needed to have its foundation elevated. However, Princeville Mayor Bobbie Jones is optimistic for the future. Jones was also able to provide updates on some of the structures in town that were vacant or falling apart. Concern has been evoked over Princeville’s levee, which was damaged during Matthew, leading to the flooding of the town. “First and foremost, we need to have our dike upgraded. Without this upgrade, we will be flooded again, because global warming is real.” Jones said. Recently, a workshop was coordinated by FEMA, North Carolina State University and the Coastal Resilience Center of Excellence Initiative, in order to give Princeville residents a look into future plans for the town and to give ideas to better their recovery. Many organizations and universities attended the workshop, including the Environmental Protection Agency, National Parks Service, Army Corps of Engineers, FEMA, Governor Roy Cooper’s office, N.C. State University, Louisiana State University, East Carolina University and the University of North Carolina at Chapel Hill. “The first free chartered black town in the United States. The story of how it occurred has been important for many years. It’s been an inspiration for a lot of people around the nation, but unfortunately it hasn’t received the attention that we all feel it deserves,” said Kofi Boone, Associate Professor of Landscape Architecture at N.C. State University in a September interview regarding the workshop. On Oct. 3, Gov. Roy Cooper visited Princeville to tour the town and check up on the recovery process. He met and spoke with the town’s residents on how they’re coping with the aftermath. According to a report from the Washington Post, Congress gave $332 million to North Carolina for immediate disaster relief in addition to FEMA’s assistance. In December 2016, the Department of Housing and Urban Development granted the state $199 million for long-term relief. That is $531 million out of an estimated $4.8 billion needed to get North Carolina back on track. Governor Cooper did not think that was enough. In April he requested $929 million from Congress, but his office estimated that only $6.1 million would be provided to the state, which is less than 1 perent of the funding required to assist affected communities. According to Cooper’s request, 3,962 properties across the state flooded during Matthew and are at risk for future flooding. Under the Governor’s requested funding, $434 million would be set aside to buyout, elevate and reconstruct properties affected by the storm. The rest of the money requested was aimed towards housing repairs, agriculture, public facilities, small businesses and health, in addition to Coast Guard infrastructure repair and the repair of National Wildlife Refuge facilities. “Governor Cooper today expressed his disappointment in the Trump Administration and Congressional leadership after they failed to fulfill North Carolina’s funding request for Hurricane Matthew recovery,” according to a press release from the Governor’s office on May 10. As of October 2017, the necessary funds have not yet been provided to North Carolina. With recent major hurricanes such as Harvey, Irma and Maria, federal funds are being redirected elsewhere, leaving little left for the victims of Matthew. “We’ve worked to keep North Carolina in the forefront, and we’ve worked to make folks in Texas and Florida understand that they are going to be where we are a year from now and that we want them to support efforts in long-term recovery,” said Cooper, in a statement to the press last week. The lasting damage in Fair Bluff, N.C.
174 miles south of Princeville sits the town of Fair Bluff. Nestled on the border of North and South Carolina in Columbus County, the community lies at the crossroads of U.S. Highway 76 and N.C. Highway 904. When Hurricane Matthew struck the state with heavy rains, Fair Bluff suffered just as much as Princeville. Built along the banks of the Lumber River and incorporated in 1873, Fair Bluff has a population of about 951. At the height of the flooding post-Matthew, the Lumber River crested at 21.87 feet, three feet higher than the previous record of 18 feet, according to statistics provided by the U.S. Geological Survey. Fair Bluff’s downtown district, built along the sides of Main Street, was submerged under two to four feet of water after the river crested in Lumberton and made its way downstream. With Fair Bluff’s struggles still at the forefront of the hurricane recovery in southeastern North Carolina, federal funds required for Fair Bluff have still not yet arrived. “Columbus County is continuing to recover, with the amount of devastation we received in the county, this recovery process could take up to another year. We still have people that have not been able to move back into their homes. The county has been receiving some funding from the state and FEMA, but it’s still not enough to cover the amount of loss the county has received,” said Kay Worley, Director of Emergency Services for Columbus County. For the town’s residents, flooding is always expected given its proximity to the Lumber River. “I was here for Hugo. Fran. Bonnie. Floyd. I’ve been here for 30 years. It’s always been the case that the Lumber River will get out of its banks,” said Al Leonard, the Fair Bluff Town Manager, speaking over the phone. But given the disastrous flood levels that were seen in and around the town, it is clear that many residents never expected flooding on a scale like this, with the river besieging the town with many feet of water. “Most of the folks around here felt like whenever the river exceeded its banks, it would be something that would be an inconvenience, but it would not be devastating,” Leonard said. According to FEMA, Columbus County has received $6.3 million from the IHP (Assistance to Individuals and Households Program), which is the fifth highest amount in the state. The county at the fourth highest is Edgecombe County, home to Princeville, with $9.7 million. As of Oct. 9, FEMA has 174 personnel still in North Carolina assisting with recovery efforts. 33 of those 174 are stationed directly in the affected counties, according to David Mace, FEMA’s Media Relations Manager for Hurricane Matthew in North Carolina. Mace also pointed out that FEMA has played a role in assisting Fair Bluff over recent months. In addition to FEMA’s assistance, the U.S. Small Business Administration and the National Flood Insurance Program have lent financial aid to victims throughout North Carolina. In regard to Fair Bluff’s total amount of federal aid, “We have not received all of it. It comes in different categories. The biggest allotment of federal money is going to be for housing, demolition and housing repairs, and we have not received any of that yet,” said Leonard. After Hurricanes Harvey and Irma struck the United States, volunteer crews from North Carolina shifted their attention southward. “Although there are still volunteer groups in our county helping with the rebuilding process, that process has slowed a bit with the hurricanes that hit Texas, Florida and Puerto Rico. Many of the same volunteers that came to Robeson County when disaster hit here have now gone to offer aid to those impacted by Hurricane Harvey and Irma,” said Dawn Gavasci, one of the Program Managers for the Robeson County Department of Social Services. Robeson County is home to Lumberton, which also suffered severe flooding during Hurricane Matthew. On a more local level, much of the Cape Fear region is recovering slowly but steadily. New Hanover County was not on the list of IHP eligible funds. 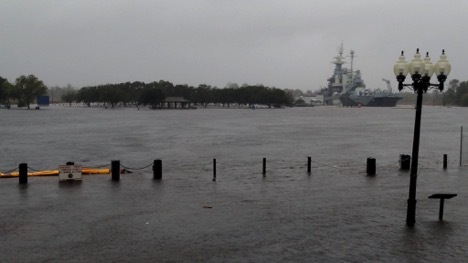 The Cape Fear River floods Water Street in Downtown Wilmington during Hurricane Matthew. Brunswick County has “fared well and received all FEMA funds that were due,” according to County Manager Ann Hardy. In Pender County, however, the recovery is ongoing in communities such as Currie, where FEMA-eligible families still await their funds, over a year after Matthew caused the nearby Black River to overflow its banks. Charities across the Lower Cape Fear have pledged support to the disaster-stricken Pender communities, with one church in Burgaw raising nearly $60,000, according to a report from Wilmington Star News. Outside of North Carolina, Matthew also caused devastation in Haiti and resulted in damaging storm surges in Florida and Georgia as well as flooding in Charleston, S.C. and Norfolk, Va.
With recent hurricanes striking the U.S. and Puerto Rico, many residents of North Carolina were uneasy at the prospect of another major hurricane venturing in their direction, but many nonetheless continue their work tirelessly, including Mayor Jones of Princeville.